To accept your Case Abstract Poster presentation please log in and click here. Leg Pain in a Recreational Athlete Unusual High Risk College Football Injury: What the Heck? It was the Neck? Stuck in the Middle: An Uncommon Cause of Foot Pain A Gripping Case in Motocross Chest Pain and Shortness of Breath in a Basketball Player Just Another Case of Growing Pains? If your case is chosen as a poster presentation, bulletin boards will be provided for you to mat your poster materials. Each bulletin board will be assigned 4 poster spots (2 side-by-side spots on each side of the board). You will be designated a space to hang your poster. Please do not allow your poster to exceed 3.5' x 3.5' OR 42" x 42" size or it will encroach on the neighboring poster space. 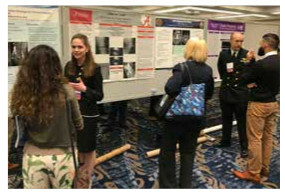 Your poster can be in any format and should include the important elements: Case History, Physical Examination, Five Differential Diagnoses, Tests & Results, Final Working Diagnosis, Discussion, Outcome and Return to Activity/Follow-Up. You will need to stand by your poster during the two designated presentation times to answer questions.